Though we are still days away from releasing our Tallahassee Foreclosure Report, the data that we've compiled has allowed us to produce a forecast on where you can expect to find distressed properties this year. Many new homebuyers like to start by educating themselves on short sales, foreclosures and bank owned properties, and there is no better way to start this process than by looking at new lis pendens filings to identify the next wave of distressed properties that will likely hit the market. Today's report identifies the most active areas in Tallahassee for new foreclosure filings and thus where we expect to see the sale of these distressed properties next year. The following real estate graph shows the most active neighborhoods in Tallahassee for lis pendens filings during 2014. By way of review, a lis pendens is the legal notice from the lender to the borrower that initiates the foreclosure process, while a foreclosure sale is the ultimate result that occurs if no solution has been achieved by the borrower. Historically, less than 15% of lis pendens resulted in a foreclosure sale because the property owner was able to fix the problem by either catching up on the loan payments, re-negotiating the loan terms, selling the property and keeping the equity, or short selling the property (rare). 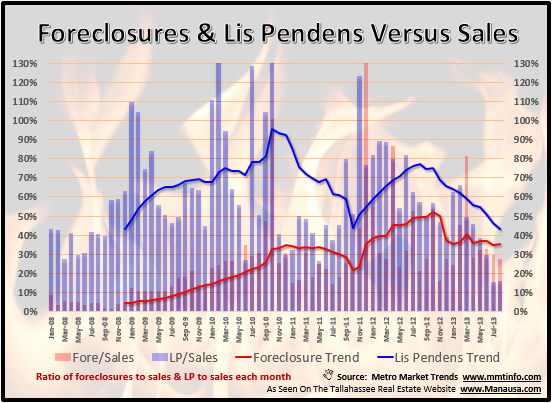 But today, with the massive decline in home values, there is no equity (or even negative equity) in most of the properties with lis pendens filings, so the foreclosure sale is the most likely solution to the current situation. With this in mind, it is likely that most of the lis pendens identified in this report will result in an available foreclosure property within the next few years. The following list shows recent distressed properties for sale in Tallahassee, and you can view the full list here. I hope our report on Tallahassee foreclosures was helpful, if you need more assistance on choosing wisely, just drop me a note and we will be in contact shortly.